Believe it or not, I had never made French macarons. Sure, I graduated from culinary school, but that doesn’t mean we made every single dessert in the world. We made more than enough, but one thing we didn’t make were French macarons. Back to the French macarons. To say they’re a trend is an understatement! So, I decided to join the maniacs and found the best recipe out there, a no b.s. recipe that told me how, what and why. Meet BraveTart. Stella is a graduate of the CIA and makes macarons every day at her job. So obviously she knows what she’s doing. She’s got an amazing “Ten Commandments” as well as “10 Myths” about macarons that will help any soul in despair! 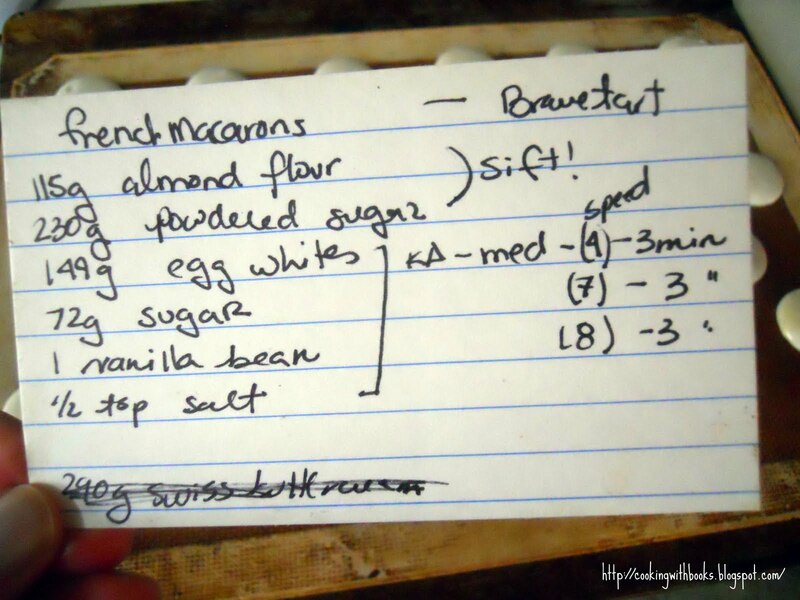 I wrote down her recipe on a note card, brought my laptop with instructions to the kitchen and baked! That was the recipe used. My recommendation is that if this is your first time making macarons, make half a batch and see how that goes. I made an entire batch and as you will see below, my macarons had teeny-tiny feet. It kind of sucked to realize I had this huge bowl of macaron batter (that I was NOT throwing out) that I would have to pipe, knowing they’d have tiny feet no matter what. Five trays later, I was done. I topped a few of the trays with black sesame seeds just for added cuteness! Half the macarons were filled with dulce de leche and the other half was an apple-cranberry curd I had in the fridge. Both were loved by my family, who had no idea why I was disappointed by the tiny feet. Needless to say, they gobbled them up! After seeing the picture of my meringue and confirming it on Twitter, the reason my French macarons had teeny-tiny feet was that I needed to whip that egg foam more. I’ll definitely do that next time! I found Stella’s directions great, but I had AMAZING support from Stella, Xialou, Mardi and Barbara. They literally (via Twitter) held my hand, reminded me to turn the pan halfway through and just gave me constant feedback on my macarons. Thank you ladies! Without you, it would’ve been almost impossible! 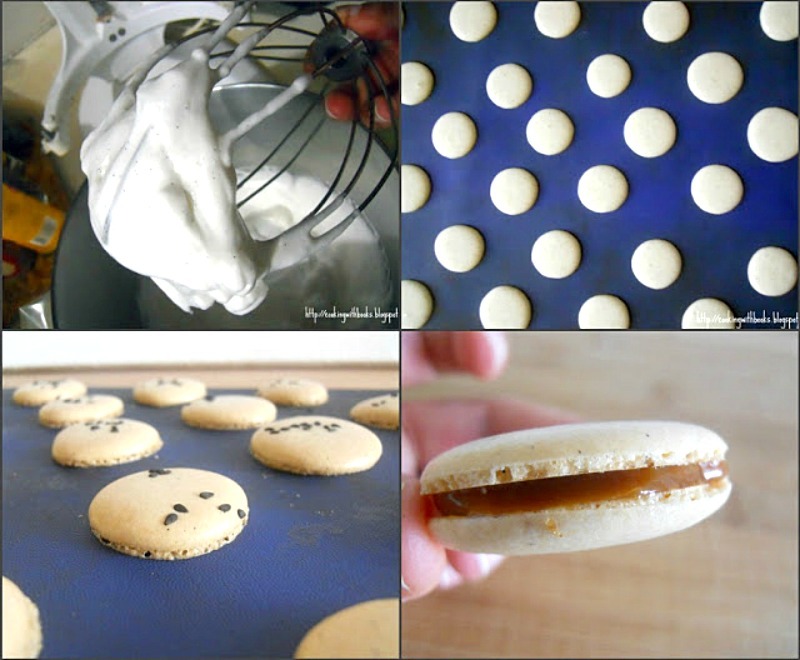 Have you ever made French macarons? What is your favorite flavor combination? Hehe, you write out your recipes on a piece of paper like me! No proper instructions, just commands like SIFT! I’m 13 and I make macarons. Yours are great! I love macarons! I’ve made them a few times and it’s never been perfect but with practice I think it will come. I love that you rewrote on a notecard – I do that all the time! Wow, girl you did such an amazing job! I never made them either and I do want to bad to try! I love yours, and pictures are beautiful! wow! darling! I’m so proud of you! and I will tell you a secret: I never made macarons neither!! holy smokes, your macaroons are gorgeous!! Beautiful macarons…also, yummy. Love the filling too. They turned out so well! Yes, I am Lora/Cake Duchess mom, although we both have a different group of followers, some blogger know who we are. Glad you found my blog, and thanks for commenting! Looks like I may be the last hold-out on the macaron craze! I have never made them either and applaud you for diving in there. It is nice to have Twitter support, I know this because you give the awesome support! Having a computer in the kitchen is a great help on many cooking expeditions! No se si se grabó mi comentario. Te decia que te he conocido a traves de Mari, y que me quedo por aquí, o lo intento que Blogger no me deja! Me encantaría algun dia animarme a hacer macarons, ojala me queden tan bien como a ti! You’re so brave… I’ve always been afraid to make these!! They look perfectly delicious!! I love the ones with passion fruit filling. Oh these look beautiful ! And I don’t see any tiny feet! I love the fillings you described: dulce the leche is my fave, hands down ! Thanks for posting! This can’t be your first time. They are so gorgeous! The filling sounds super delicious. nella, beautiful macarons!!! they are quite difficult to make from what i hear. it’s an art! i’ve never tasted one before actually…lol. i heard there are vegan macarons! Don’t worry, friend. Your feet will grow! And I bet they were tasty, even w/dainty feet! I am late for the party! They are beautiful, Marnely! And the fillings are yummy! Baking macarons is quite addicting! Your first macs turned out GREAT! Yay feet! I’m sure they’ll just get more beautiful with time and experience. Great job, girl! Now I do not feel so bad that I have waited this long to try them…I am going to though. I have some egg whites waiting for me in the freezer! Maybe one day this week if it is not too hot. Feet or no feet they look delicious! Never met a Macaron I did not love! As I’ve said before, anything with dulce de leche must be good, and I’m sure your macarons are no exception! I too have never made them before, but am always mesmerized by the beautiful macaron photos I see on blogs. Hopefully I’ll make some soon, but the gluten-free pasta is my challenge for today :-)Love your teeny-tiny feet! Yours turned out just beautiful! I think I have an oven issue:-p You are awesome! Excuse me Nellie Bellie they are the purr-fect feet and most adorable macarons. SO you hot the Mac bug too. So proud of you girlie. That explains my peanut ones 1/2 the tray had feet and 1/2 didn’t maybe because I didn’t turn the tray 1/2 way around?! Hmmm could have been many reasons. You did a gorgeous job here!! Cute! Yeah, I found my first batches didn’t have the right feet but as I beat the batter more, subsequent batches had better feet. Bravetart’s recipe and no-nonsense approach are the best, though! Nice job! You are way too kind to me but also way too hard on yourself. Any kind of feet on your first try is a bonafide sign of success! I’ve only made them a couple of times but am sure that your combination with dulce de leche would be a favorite! Well,, I think you did a great job on these! Okay, if you’ve done it I have to give it a try. The closest I’ve come to CIA is a tour and eating in the restaurants but I’m always up for a challenge. I wonder if I dare post about it if mine are a total disaster? Nelly, you are such an inspiration! I think these look fantastic for a first time. I will take your advice and make half a batch and see how it goes.